Cut chicken and pork into strips and put through a meat grinder using the medium/large disk. Mix together ground pork & chicken, egg, mayo, diced onion, salt, pepper and 1/2 cup breadcrumbs. Mix thoroughly. Add 1 tbsp water if meat seems too dry. Form 1-inch balls with the katlety mixture. They should be just a bit flattened and not a perfect ball. 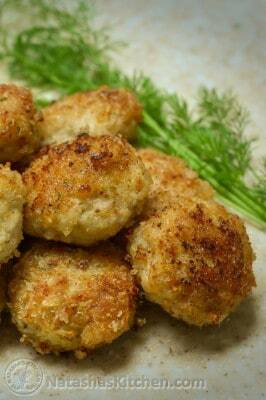 Roll meatballs in bread crumbs. In a large skillet, heat about 1/4 cup canola, grapeseed or sunflower oil over medium heat. It should be enough to just cover the bottom of the pan. Saute meatballs in batches, turning them over a couple times during the process. Add more oil as needed for subsequent batches. Katleti are done when they are golden brown and cooked through.